The TWiV crew reveal a unique portal on the calcivirus capsid formed upon receptor engagement, and the regulation of interferon responses in virus-infected cells by methylation of mRNA. The TWiVumvirate reviews this years crop of Nobel Prizes, and how cells prevent leakage of mitochondrial double-stranded RNA into the cytoplasm, which would otherwise lead to the production of interferon. The TWiVumvirate discuss the giant Tupanvirus, with the longest tail in the known virosphere, and dampened STING dependent interferon activation in bats. Ben tenOever joins the TWiVoli to discuss the evolution of RNA interference and his lab’s finding that RNAse III nucleases, needed for the maturation of cellular RNAs, are an ancient antiviral RNA recognition platform in all domains of life. 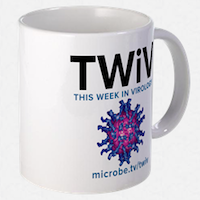 Nels and Ed join the TWiV team to talk about their observation that regulation of the human interferon response depends on regulatory sequences that were co-opted millions of years ago from endogenous retroviruses. The TWiVniacs discuss twenty-eight years of poliovirus shedding by an immunodeficient patient, and packaging of the innate cytoplasmic signaling molecule cyclic GMP-AMP in virus particles. The TWiVsters explore mutations in the interferon pathway associated with severe influenza in a child, outbreaks of avian influenza in North American poultry farms, Ebolavirus infection of the eye weeks after recovery, and Ebolavirus stability on surfaces and in fluids.